It is hard to think of a 24-year old at a career crossroads, but last summer Brett Connolly might have found himself standing in one. A sixth-overall draft pick of the Tampa Bay Lightning in 2010, he steamrolled through his last year of Canadian juniors, scoring 46 goals for the Prince George Cougars of the Western Hockey League. Then, he made the leap to the big club the following year, getting the call in 68 games for the Lightning in which he was 4-11-15. It seemed to be a decent foundation on which to build a solid career in Tampa, but his progress came to a crashing halt the following year when he appeared in just five games for the Lightning and spending the bulk of his time with the Syracuse Crunch in the AHL. It was only marginally better the following season – 11 games with the Lightning and 66 with the Crunch. In 2014-2015 he did seem to retrieve a bit of his scoring touch at the NHL level, scoring a dozen goals for the Lightning in 50 games, but he was a trading deadline casualty, sent to the Boston Bruins for a pair of second round draft picks. In a season and change with the Bruins, Connolly scored nine goals in 76 games, his career scoring line amounting to 27 goals and 59 points in 210 NHL games with two clubs. It was not the profile of a sixth-overall draft pick, and at the end of the 2015-2016 season he became a free agent, Boston declining to extend a qualifying offer to the player. With the Caps more or less set among their top six forwards, and perhaps even their top three forward lines, it was not immediately evident just what role an offense-oriented former top prospect fallen on hard times would play. And it did not help Connolly that he played only intermittently over the first month, appearing in just seven of the Caps’ first 15 games, recording just one point in the process (a goal against Calgary on October 30th), and just 17 of the Caps’ first 31 games (3-1-4, minus-1). Starting on December 23rd, though, Connolly appeared in 49 consecutive games and going 12-7-19, plus-21, while averaging just 10:41 per game in ice time, for the most part on what was a solid third line for much of the season. Still, Connolly’s ten-game splits were a bit odd. His first four splits were light on production, a reflection of his intermittent play early on and settling into a role once he stuck in the lineup. His pace picked up measurably in his fifth, sixth, and seventh splits over which he was 10-5-15, plus-17, over 30 games. But he went almost silent in his last split of the season in which he dressed for 10 of the last 12 games (0-2-2, minus-1). He still had good possession numbers overall, finishing third among Caps forwards playing in at least 25 games with a 53.92 percent Corsi-for at 5-on-5 (numbers from Corsica.hockey). When teamed with Lars Eller and Andre Burakovsky on the third line, he and his cohorts had the third-best Corsi-for at fives on the club (58.57 percent). Fearless’ Take… That secondary scoring certainly comes in handy. Washington was 12-1-2 in the 15 games in which Connolly scored a goal this season, 16-1-2 in games in which he recorded a point. He was also consistent at home and on the road. 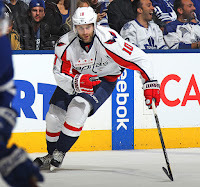 At Verizon Center he was 7-5-12, plus-10, in 32 games, while on the road he was 8-3-11, plus-10, in 34 games. Cheerless’ Take… Connolly seems to suffer from that weird Jason Chimera Syndrome thing. You know, the one where he’s hot one year, cold the next, then hot, then cold. With Chimera it was his goal totals. With Connolly it’s his shooting percentages… 4.3, 10.0 (ok, in only five games), 8.3 (alright, in only 11 games), 14.5, 9.5, and then 18.5 percent with the Caps this year. And more Connolly wasn’t necessarily a better thing. The Caps were 16-4-1 when he skated less than ten minutes; they were 16-3-1 in games in which he didn’t record a shot on goal (and he didn’t so much as record an assist in any of those games, either). Odd Connolly Fact… Brett Connolly was the only player in the league to average less than 11 minutes of ice time per game and record 15 or more goals. And that isn’t even the odd part. Among players with at least 500 minutes of 5-on-5 ice time, Connolly was 13th among 351 forwards in goals-per-60 minutes (1.28; numbers from Corsica.hockey). Brett Connolly had one shot against his former team this season, figuratively (the only game against the Bruins for which he dressed) and literally (he recorded one shot on goal). The Caps took a 2-0 lead at Verizon Center before the game was 15 minutes old, but Boston tied the contest on a pair of goals by Brad Marchand wrapped around the first intermission. Alex Ovechkin broke the tie in the last minute of the second period, but the outcome was still in doubt as the third period started. In the fourth minute, Evgeny Kuznetsov skated the puck through the neutral zone and gained the offensive zone. Pushing the Bruin defense back, he fed the puck across to Dmitry Orlov in the middle. Orlov sent the puck ahead to Connolly darting in from the right wing, and Connolly lifted a backhander past goalie Tuukka Rask as he was cutting across the top of the crease. It was the game-winning goal – his only such goal on home ice this season – in the Caps’ 5-3 win. If you are not a penalty killer, and your teammates are taking a lot of penalties, you are going to spend a lot of time watching a game, not playing it. Such was the case on March 4th when the Philadelphia Flyers visited Verizon Center. Brett Connolly skated five shifts in the first period for 3:01 in ice time. But when the Caps took two penalties in each of the last two periods tow give the Flyers four power plays after giving the Flyers a pair of man advantages in the first period. Philadelphia did not convert any of the power play chances, but Connolly skated just five shifts combined over the last two period and finished the game with just 6:04 in ice time, a season low. The only mark on his score sheet line was a shot attempt that was blocked. Before the 2017 postseason, Brett Connolly had no games of playoff experience in his career. His first experience was odd and disappointing. Dressing for all six games of the opening round series against the Toronto Maple Leafs, he had what amounted to two distinct series, neither of which were productive. In the first three games he averaged about 12 and a half minutes of ice time. He did not record a point, and he had just four shots on goal. In the back half of the series his ice time was cut significantly, averaging less than five and a half minutes per game and recording only one shot on goal without a point. He dressed for Game 1 in the second round series against the Pittsburgh Penguins, but he skated barely six minutes with just one shot on goal. He did not dress again in the series. Brett Connolly did what a player in his position had to do, to a point. He came in on what amounted to a low-risk, high-reward contract with the Caps that, if he performed well enough, he could parlay into a better deal with longer term when his contract with the Caps was up. After shaking off the inconsistency and intermittent appearances early, he performed quite well, displaying a high level of efficiency in the minutes he got. But it dried up late in the season, and he (along with a lot of his bottom six forward cohort) underperformed in the postseason. 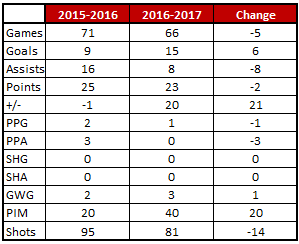 What had been a strength where it was a weakness the previous year – the bottom six forwards – once more became a weakness when it mattered. Brett Connolly was a part of that, and it cost him what might have been a very high grade.